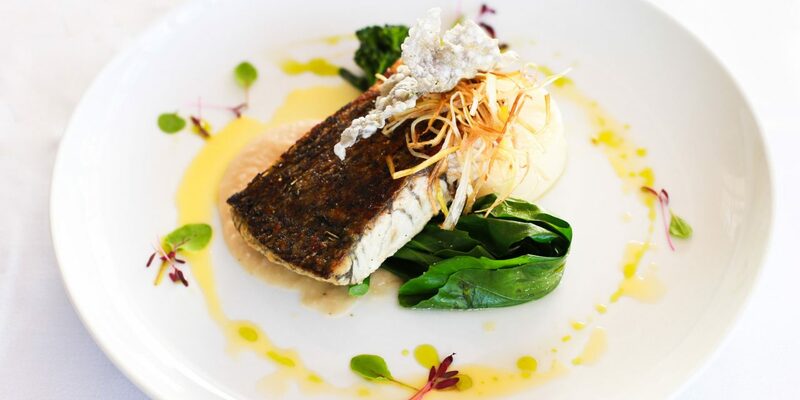 Walking into the 1920s building of Mercure Hotel Canberra, one must envisage a certain element of style and sophistication present beyond its doors and within the culinary delights served. This is exactly the impression you get as you make your way past the crackling open fireplace and through the glass doors of Courtyard Restaurant. With iron-pressed white table clothes and perfectly appointed tableware for each course, I immediately felt a bout of excitement for the dishes to come. 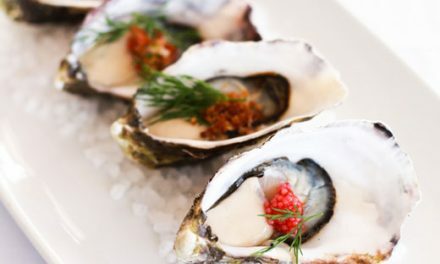 As Canberra sits away from the coast, being able to locate reputable seafood is rare. However, that’s precisely what you’ll find at Courtyard. 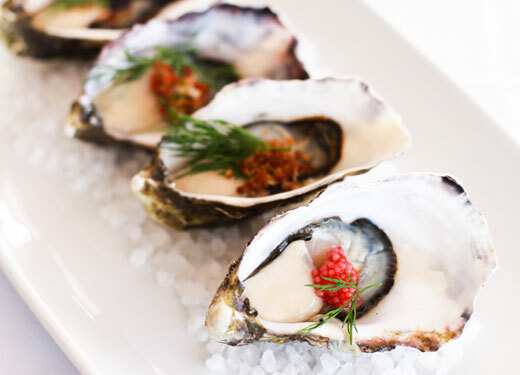 The seafood is sourced from the finest produce available at the Sydney Fish Markets, transported to the venue on ice to preserve the gorgeous, delicate flavour of the morsels and cooked ever so gently by Head Chef Anthony O’Connell. To start the meal, we were presented with four versions of the Pacific Oyster. The flavour of the monstrous crustaceans was delicate, creamy and smooth, giving a nod to simplicity and highlighting the star of the dish. On the rock-salted platter perched a natural, soy and ginger, mango and mint, and a pancetta crumb version to add a salty, yet cured flavour to the dish. Following on-trend, the waiter placed down what I consider the biggest prawns I’ve ever seen. 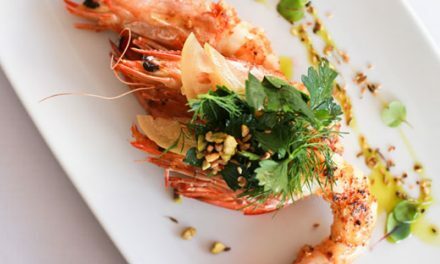 The Hot Jumbo Prawns with dukkah spice, chilli mayo dip, preserved lemon and parsley, exhibited a number of elements that, while intriguing, heightened the flavour of the prawn. 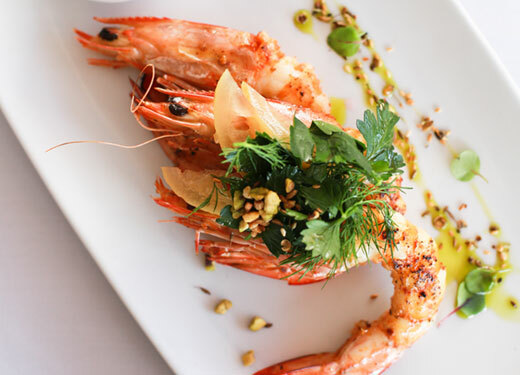 The succulent, meaty prawn was grilled in a touch of spice that was extinguished by the chilli mayo dip, and the fragrant dukkah spice and preserved lemon added texture and bite. As I licked my lips and scraped my knife for the last drop of that magnificent chilli mayo, a metallic fin caught my eye on a dish coming out of the kitchen. To my surprise this was not a fin at all, it was the feature of my next dish – the crispy-skinned Barramundi in lemon thyme with a bean skordalia, potato fondant and metallic sago crackle. Fish and lemon are but a match made in heaven, and with the earthy taste of the potato fondant and bean skordalia, this dish simply works. To keep your taste buds guessing, the crispy texture of the sago crackle and skin of the fish are a welcome edition. While it’s clear that Courtyard is at home in the surf, the addition of turf pops up on the menu a handful of times, notably with the 300g Angus sirloin. As the meal was placed before me I wondered if I, like the cow itself, may need more than one stomach to fit in this monster of a meal. With a bevy of elements including gratin potato, pancetta spears, parsnip puree and broccolini, I would have to say that the stand-out was the peppered jus. This velvety sauce combined the elements together perfectly with a bity, satisfying taste that made each bite more enjoyable than the last. Now to the pièce de résistance dessert! 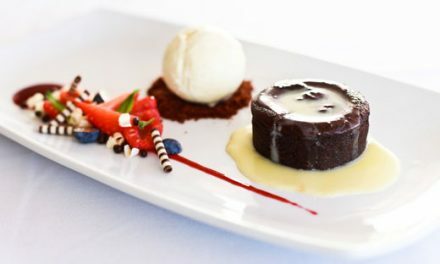 And with chocolate on the cards, Courtyard could do no wrong. 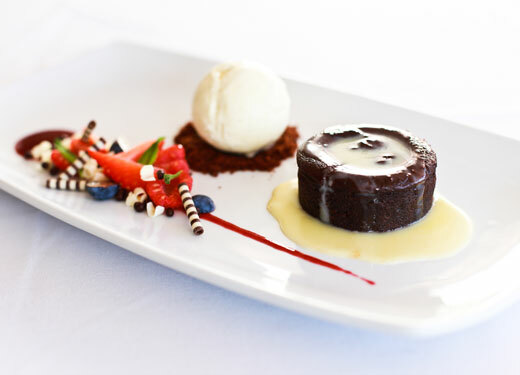 On a small platter was presented a delicate dessert of warm chocolate fondant with white chocolate sauce and chocolate pearls among house-made vanilla bean ice cream, berry coulis, an assortment of berries and a sprig of mint on the side. This is a dessert that demands silence at the table. Whether you’re staying at the hotel, looking for a new date spot or want to treat the kids to a spectacular meal, book a table at Courtyard Restaurant.